Mid-Century Modern buildings form a vital part of our architectural heritage and comprise a significant fraction of today’s overall building stock. Such buildings were constructed at a unique point in the dialogue between ‘passive’ and ‘active’ design strategies. Previous designs frequently relied on heavy thermal mass, passive strategies for ventilation, and moderate levels of glazing to provide daylight and exterior views. Such moderation was necessary, given the detrimental impact large amounts of glazing would have on heat loss in winter and overheating in summer. The spread of air conditioning and fluorescent lighting technologies in the 1930s and 1940s freed designers from these constraints, allowing deeper floor plates, lower ceilings, and the use of greater expanses of glass. Yet this transparency came at a cost. Many buildings of this era consume significantly more energy than comparably sized buildings constructed before or since. Figure 1: Site Energy Use Intensity of US commercial buildings surveyed in 2012, sorted by era of construction. The spread of EUI among buildings within each era of construction is indicated by 25th, 50th, and 75th percentile markers. Within each construction era, EUI is not distributed symmetrically; high-EUI buildings pull the average EUI well above the median (50th percentile). Buildings constructed in the Mid-Century Modern era exhibit EUI values that are higher than those built before 1920, but lower than most buildings constructed later. The average EUI of all buildings in the dataset (all ages) is 252 kWh/m2/yr. (CBECS 2012). Is this the best we can do? Recent construction projects have demonstrated exceptional levels of performance by combining the ‘passive’ design strategies of the 19th Century with the materials and systems of the 21st. Does this mean we should demolish and replace our existing inefficient building stock with efficient new buildings? Hardly. While such construction results are impressive, recent “deep energy retrofits” of Mid Century Modern buildings have demonstrated that it is possible to achieve high levels of performance—matching or beating the median recently constructed building in the US—while avoiding the substantial carbon emissions associated with the extraction, refining, and assembling of materials for new construction. By thinking in terms of ‘carbon payback’—where cumulative lower annual emissions for an efficient building pay back the one-time emissions associated with renovation and construction, we can map out a path to minimize global emissions in the critical period between now and 2050, as utility electric production transitions to low carbon sources. Case studies show that such solutions can make sense not just for buildings deemed of high architectural significance, but for ‘low road’ buildings as well. Figure 2: The Pan American Life Building, New Orleans, by Skidmore Owings and Merrill, as it looked in 1952. The Pan American Life Building in New Orleans, Louisiana, designed by Skidmore, Owings and Merrill opened in 1952 and featured four stories of ribbon-windowed offices protected from solar gain by generous floor slab projections. The building passed through a series of owners over the years but stood vacant following Hurricane Katrina, after which time vandals significantly damaged the interior. As part of a construction replacement project for the nearby Veterans Administration Hospital, the building was identified to serve as the new administration building for the hospital complex. In consultation with the client and state and national preservation agencies, the design team took the utmost care to preserve and restore the building exterior, while liberally updating the interior. The integrity of precast concrete and limestone building cladding was verified through field testing and replaced where necessary. The 60-year-old mechanical system was replaced with a modern variable air volume system with overhead distribution and a high level of individual control, supplied by a new high-efficiency central plant. Figure 4: Wall section detail, Pan American Life Building. In combining an improved building envelope with a more efficient mechanical system and central plant, the building was designed to provide a high level of thermal comfort, natural light and views at an energy use intensity 22% better than a newly constructed building built to meet current code. 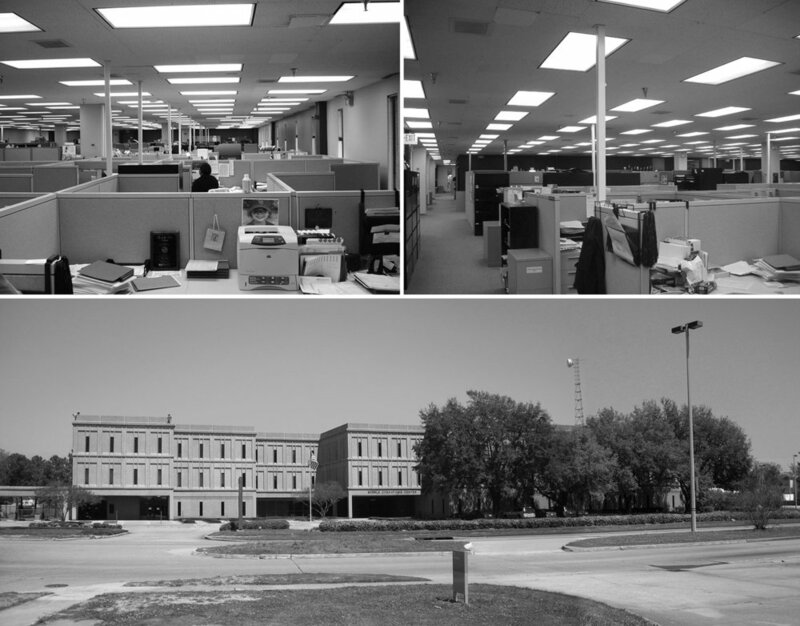 In 2010, the Lamar Advertising Corporation held a design competition to determine how best to transform an unloved late Mid-Century Modern data center into their new headquarters building. The building, clad in precast concrete panels punctuated with dark, vertical slit windows, offered little connection to the natural environment. The winning design team convinced the client that what mattered most was not the appearance of the building to passerby, but the experience of the employees within. By replacing the dark glazing with modern high-visible transmittance spectrally selective glazing, views and adequate daylight levels were provided to exterior offices. The experience of interior employees was transformed by coring out sections of the deep floor plate (Figure 7), allowing multi-story landscaped atria (Figure 8) and spaces for social interaction (Figure 9). In effect, the façade was saved simply because it didn’t matter so much anymore. Figure 7: Sectional cuts to extract ‘cores’ of the existing floor plates, Lamar Headquarters building. The project incorporated standard best-practice mechanical systems and building envelope insulation levels as required by building code. The resulting facility has a measured Site Energy Use Intensity of 170 kWh/m2/yr, 33% better than the average commercial building in the US in 2012. 1. New construction in the US and Europe averages merely 1-2% of the existing building stock. Even if all new construction were ‘net zero’ buildings, the effect after 30 years would only be a modest reduction in energy use. Meanwhile, 3-5% of existing building stock changes ownership each year. Such transitions provides an opportunity at time of sale or a change in tenancy to implement substantial performance improvements. 2. New construction, even in those projects with a determinate eye towards building green, contains a hidden culprit: embodied carbon, or the carbon emitted when materials are mined, manufactured, and transported. Such activities comprise some ten percent of global emissions alone! It doesn’t have to be this way. Buildings can become part of the climate solution. Thinking about carbon accounting over the lifespan of a building means that renovating, rather than replacing, existing buildings can be the right thing to do environmentally. To take things a step further, new and innovative building materials are changing the ways in which build. Affordable, low-carbon concrete alternatives, and plastic cleaned from the ocean and turned into building blocks, can reduce the carbon footprint typically associated with even new construction (For further information regarding carbon analysis on new buildings, visit our recent blog post by Tom Gibbons on the Dalney Building at Georgia Tech). With such paradigm shifts in mind, we can plot the cumulative carbon emission patterns over the life of the building, as shown in Figure 10 for (a) standard new construction (b) best practice new construction (low carbon construction, very low carbon operation), (c) existing Mid Century Modern buildings undergoing a best-practice deep-energy retrofit, and (d) the carbon signature of demolishing & replacing the building with typical carbon construction / low carbon operation. As the figure shows, deep energy retrofits ‘pay back’ the carbon invested in just a few years (when cumulative carbon emissions for the renovated building crosses that of the un-renovated building). On the other hand, replacing an existing building with standard new construction can take decades to cross the un-renovated building’s extrapolated emissions. Figure 10: Cumulative carbon emission signature over the life of a building: (a) standard new construction (b) best practice new construction (low carbon construction, very low carbon operation), (c) existing buildings undergoing a best-practice deep-energy retrofit, and (d) the carbon signature of demolishing & replacing the building with typical carbon construction / low carbon operation. Thus lies both the answer and the challenge – deep energy renovations that preserve the best qualities of buildings from this period, while providing improved comfort at reduced energy consumptions; as case studies have shown, such solutions can make sense, not just for buildings of important architectural significant, but ‘low road’ buildings as well.